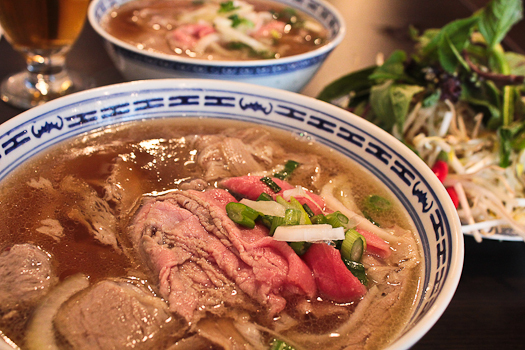 Montreal's Best Pho 2016 - Shut up and eat. The best pho in Montreal. There, I said it. I don’t make proclamations like this lightly. I ate over 50 bowls to bring you the best. When I say something is the best, there is a reason and theory behind it and I take this kind of responsibility seriously. I’ve written about the best pho in Montreal a couple of years ago and decided recently that it deserved an update. Not to say that the previous listing is no longer valid, but because I’ve been to so many more Vietnamese restaurants to have pho since then that I needed to share my discoveries. Pho is one of my favourite dishes. A comforting hearty bowl of rice noodles, beef, veggies swimming in the most flavourful, aromatic broths that soothes the soul and warms the coldest of hearts. With so many options in the city, I made it a personal goal to find the best pho (tonkinese noodle) in Montreal. 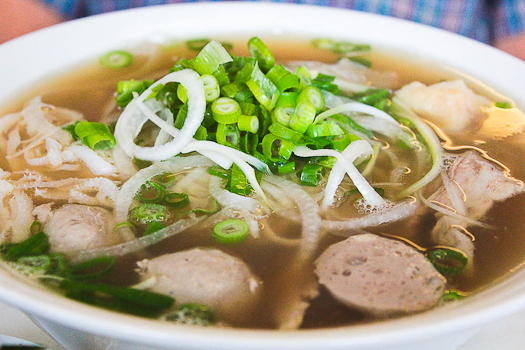 What constitutes as being the “best” bowl of pho? I quantified this by using the “dac biet” – more commonly known as the restaurant’s “special” noodle or the “all dressed” as the ruler by which pho is evaluated. The bowl consists of, brisket and flank (both lean and fatty), steak, tendon, tripe and Vietnamese meatballs. A restaurant’s pho kung fu is judged based on its soup. If the broth is no good, then the entire bowl is pointless. 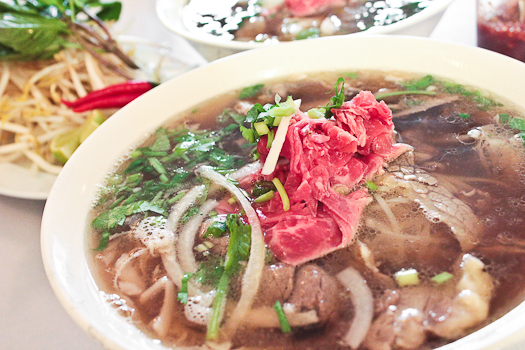 A delicate balance of beef bones, oxtail, and various cuts of beef simmering for hours is the base in which a delicious bowl of pho is built upon. Highlighted with aromatics in the cooking process to achieve, the soup is the underrated star player in a bowl of Tokinese noodle. Here’s the map of all the places I’ve been to so for to compile this list. As you can see there has been many additions since my original list of 32 restaurants. So how do I assess each restaurant? I have a checklist of criteria that each bowl needs to meet in order to consider it in contention as one of the city’s best. The first thing I did was revisit the top 3 from my original article here to see if I would still consider them the top 3. The results will surprise you. Undeniably my most favourite restaurant in the city for pho. Nguyen Phi is always my top recommendation and has been for years. It was the #1 rank from three two years ago and again today. This family run Vietnamese restaurant offers all the classic dishes on a Vietnamese menu but you come here for the noodles. The broth is exceptionally deep in flavour and fragrant in aromatics; onion, ginger, clove and cinnamon are infused into the soup. Each ingredient plays a specific roll in coming together as my perfect bowl of pho. From the tender slices of beef, to the strands of shredded tripe that find their way into every bite, the dac biet at Nguyen Phi is an example of harmonious flavour combinations and contrast in textures. The soup here is delicious, but it’s the consistency of their product that keeps me coming back. My number two spot of the best bowl of Tokinese noodles in Montreal is occupied by three restaurants, let me explain. Not a chain of restaurants, Pho Nam Quan, Pho Thanh Nam Quan, Pho Thanh are all owned by the same family. The original restaurant Pho Nam Quan, was listed in my initial Top 3 a few years back, and they have since opened two more restaurants under derivative names. In the name of finding the best in the city, I ate at all three restaurants numerous times to make sure I would be able to lump them together in the same listing with confidence. Their signature large slices of chewy tendon is magic in your mouth. Aesthetically they may all look different, but the taste is identical for the most part. Pho Nam Quan’s broth is a bit heavier in flavour but still comparable to the other two locations. Again, the consistency of the soup amongst all three stores is what’s impressive and integral to a successful bowl of noodles. Sen Vang has flown under the radar for a while now but for people in the know, this spot is a closely regarded secret. The flavour of the broth is rich. Having spoken to the owner on several occasions, his passion for perfecting the flavour profile of his soup comes out in his final product. The meticulous focus on details regarding the preparation, cooking and finally serving, is admirable. He enlightened me on his technique to maintain the taste of his soup consistent throughout the day. I’m not at liberty to divulge his secret technique, but it may or may not involve a form of reboiling the soup to each order. Located across the street from the Côte-Sainte-Catherine metro station, this modest family run restaurant has proven itself as a contender for being one of the best places for Tokinese noodle in the city. Situated on a very awkward part of Saint-Michel Boulevard close to the circle, I recently found this place by accident while waiting to merge into traffic. What caught my eye the first time around was their large covered terrasse. There’s nothing like eating hot soup outdoors in the summer while inhaling exhaust fumes from the highway that will throw you back to your backpacking days in Southeast Asia grubbing on street noodles. 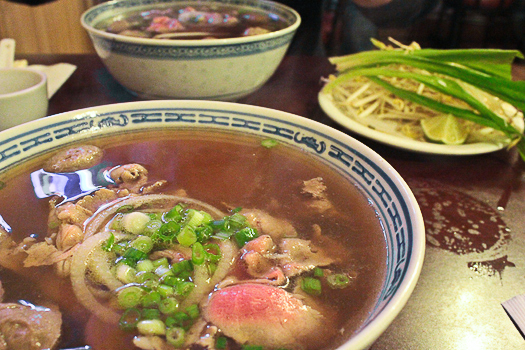 The soup at Duy Anh is incredibly deep, robust in beef flavour and salty. After visiting on numerous occasions, I noticed that the soup was always on the higher end of salty – which is not necessarily a bad thing. The soup definitely and permeated the noodles and helped season the generous portion of raw beef that was piled high. 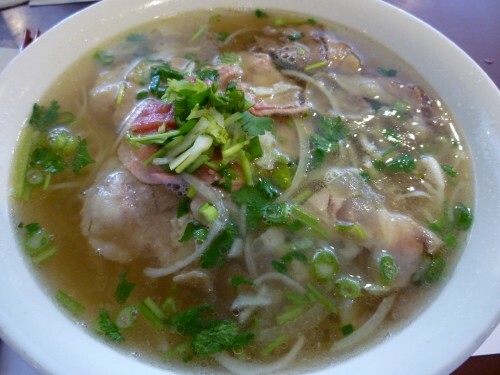 Pho Tay Ho has been one of my favourite for years, but not for the dac biet, but for their chicken pho. I know, I said I would be gauging the city’s best based on the house special but I think this unique pho Ga deserves a mention and a spot on the top five. 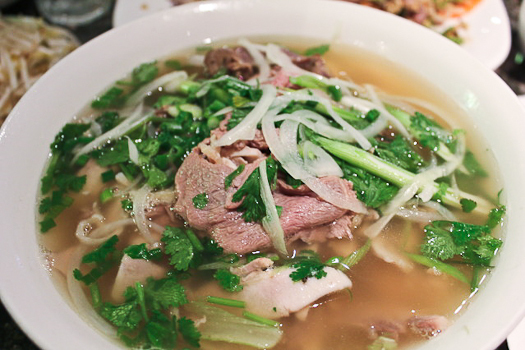 The Pho Ga, Long ga, Tai is a chicken based noodle soup that includes generous pieces of chicken, chicken heart, liver and gizzard as well as slices of rare beef. Yes, it can be a bit intense for some (there is an option without the offal that is a bowl of chicken and rare beef) but the flavour combination is incredible. The chicken soup is flavourful and sweet with floral hits of coriander and ginger. The addition of organ meat and thick cut slices of rare beef adds another level of deepness to the soup. This cannot be missed. I ate over 50 bowls to bring you the best in Montreal. Pho is a finicky animal, with a cauldron of soup that is continuously boiling and simmering throughout the day, constant adjustments are needed to achieve a quality that the chefs strive to maintain. 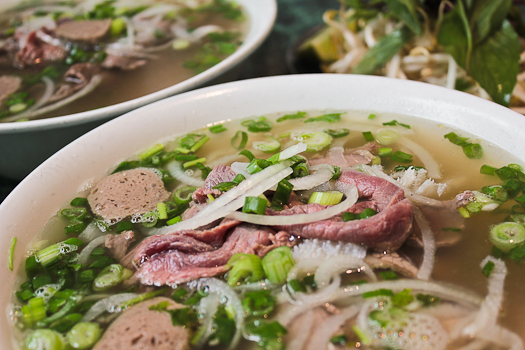 A bowl of pho is simple and humble but the preparation is far from easy. The winning formula for an awesome soup is often a family recipe. Essentially every bowl is like an invitation to a family meal. The top five represent the passion and dedication these restaurants exude to provide a consistent product that will be appreciated by all phonatics of pho. I wwwould have liked to have heard what your thoughts were on Pho Than Long on St Catherine east of Metropolis. They have been my favorite for 2 decades with their Raw beef ( #8 ) being my standing order for over a decade. Oh man… blast from the past. I haven’t been there in years. I used to only ever go there for beef roll specialty. I’ll definitely have the Pho Ga with giblets at nearby Pho Tay Ho. I don’t like their beef Pho as much as some others, including your favourite in CDN. The duck shop at JTM has packages of duck hearts, duck livers and duck gizzards. Yes, I know Marché Oriental has them all mixed together, but in this case I found the quality of Le Canard libéré better, and unlike their duck (muscle) meat, their giblets are very well priced. Those are also very good in “dirty rice”. I only go to Tay Ho for their chicken pho – I think it’s probably the best in the city. 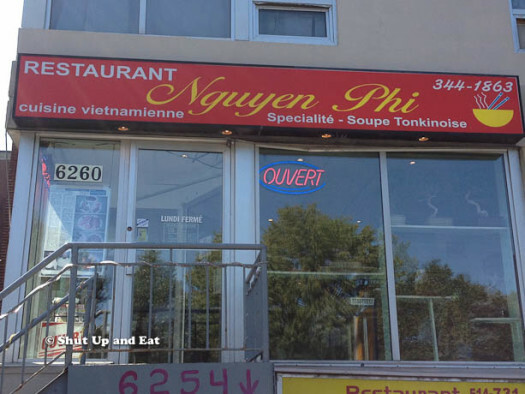 NB Pho Nam Do moved, not far from its original spot, but across Jean-Talon to the other side of St-Denis. It’s tucked in next to a row of other Asian businesses now, including the Marché Oriental and the Hung Phat. Space used to be a resto called Tra Vinh. We ate at Nguyen Phi at 1 pm-ish and here it is 11 pm and I am still thinking of that bowl of pho. Thank you, and bigger thank you. 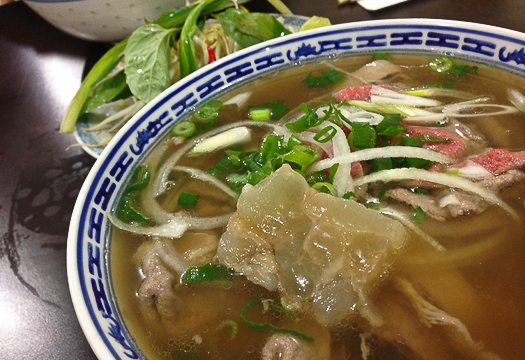 Did you get the chance to try Pho Rosomont?